﻿ Modem. Tweaker. Network Tweaker. WinTools.net - wintools, software tools for MS Windows. 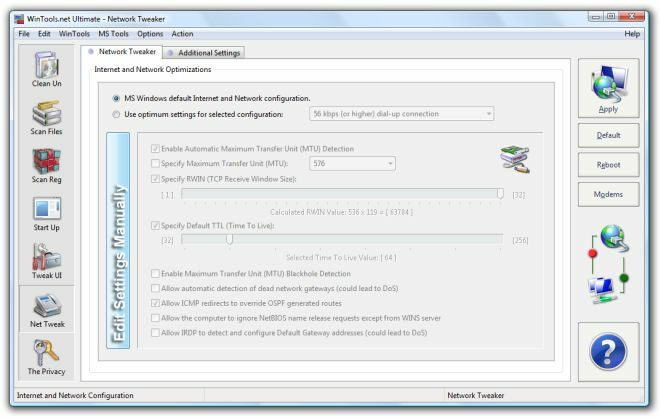 "Net Tweaker" tool is used for speed increasing of data transfer by changing hidden network settings. With equal speed connection on different computers different speed of data transfer is possible. The thing is TCP/IP is for transfer of packets of data. The packets can be of different degree of compression, of different size, time of life, can have different error repeats? That is why under different settings, equal speed of connection completely different speed of data transfer is possible. Changing settings with the help of "Net Tweaker" tool you can get more stable work with bad connection(at the same time you can lose some speed) or you can get higher speed of data transfer with good connection at the expense of stability which will be provided by good connection line anyway. On default Windows network settings are optimized for moderate connection. While working with Windows some programs set these settings for themselves not notifying the user about that. In that cases you can have an impression that after Windows installation the connection was more stable but after some time of work with the system it became worse and it is not clear why. In that case with the help of "Net Tweaker" tool you can get original settings. To do this choose the option "Windows default Internet and Network configuration", do not forget apply settings by "Apply" button and reboot the computer. After settings application "WinTools.net" program will refresh all network settings according to the original system settings and the connection must be the same as it was after Windows installation. For more thin setting you have to select option "Use optimum settings for selected configuration" choose connection suitable for your situation, apply settings by "Apply" button and reboot the computer. You can also edit connection settings manually and get greater speed or stability. Note: You can always get back to standard system settings.